The Organisation for the Prohibition of Chemical Weapons has not yet announced whether chemical weapons were used in the city of Duma, Syria, in April. Meanwhile, the U.S.-led airstrikes that hit Syrian facilities in response are criticized, with some observers on social media calling it both illegal and a war on Syria. The airstrikes acted in accordance with the Responsibility to Protect, which outlines when a state has a responsibility to intervene in the affairs of another. Since the U.S., France and the UK identified and struck only key buildings in Syria’s chemical weapons program, the attacks were proportional to what triggered them. And since Duma would only be the latest case of chemical weapons use by the Assad regime, diplomatic options have so far failed. When viewed in isolation, the turnaround between the attack and the airstrikes seems fast. But, in reality, the airstrikes were a last resort. What some seem to take issue with is the evidence. They believe that without a conclusion from the OPCW, the use of chemical weapons has not been proven—any intervention would be based on unsatisfactory evidence and so be illegitimate. But when other states and even supranational organizations weigh in with their support, it is clear there is something to an intervention. The U.S.-led airstrikes on Syrian facilities in April were not a NATO intervention, but they were conducted by three NATO members—the U.S., the UK, and France—and NATO expressed explicit support for them. It did so because the use of chemical weapons is a line that countries cannot cross. Different weapons are used for different purposes. When political actors want to hit far-away targets with little risk, drone strikes will do. They use soldiers when their aim is to conquer. And they use chemical weapons when their goal is to cause the most harm to the greatest number of people possible. The difference between “conventional” weapons and chemical and biological weapons is that the latter do not discriminate. Chemical weapons are inaccurate and nearly impossible to control once used; gases like chlorine or sarin spread over wide areas and harm everyone, whether soldier or civilian. Sarin in particular is a lethal nerve agent that contaminates clothes and food. It drifts through buildings and down to basements where people might be hiding. That is why the cult Aum Shinrikyo used sarin in the Japan gas attacks of 1994 and 1995, why Bashar al-Assad’s regime used it against Syrians multiple times before, and why Assad may have used it again in Duma on April 7, 2018. But even if chemical weapons are not used, the international community should intervene if there is reason to believe they are. The use of chemical weapons is forbidden in the Chemical Weapons Convention, with most of the countries of the world party to the treaty (including Syria). If Syria appeared to violate that treaty, it would have broken a key rule; the airstrikes that targeted Assad’s facilities in response were to try to ensure that never happened again. The U.S., UK, and France were right to intervene—firstly, to hinder Assad’s capacity to use the weapons again, and secondly, to show that certain rules cannot be broken without repercussions. The world cannot afford to wait for a third party to investigate and test when it comes to chemical attacks. The longer it takes to obtain confirmation, the more people may be harmed or killed. This was especially true after Russia blocked the U.N.-OPCW Joint Investigative Mechanism, which could have assigned blame for the attacks. During this time, OPCW could only state whether or not chemical weapons were used. It was, essentially, a trial without a ruling. This means that whatever the conclusion of the OPCW, the international community acted as best it could. And since it looks like Russia now opposes the organization altogether, there may never be agreement on chemical attacks. There will always be doubt. 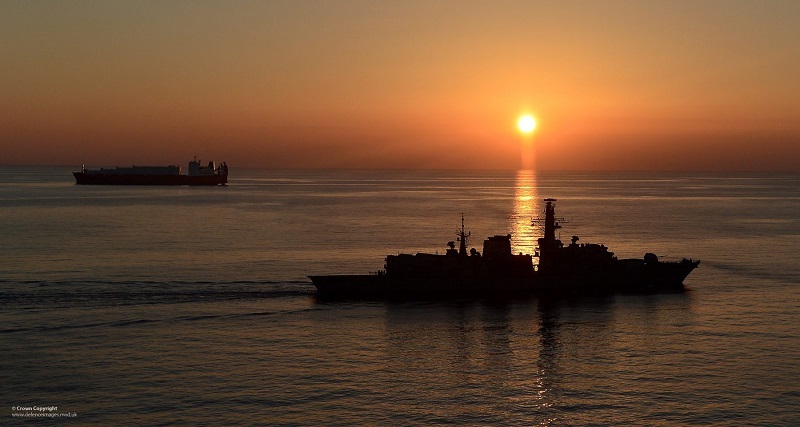 Photo: Ships of Op Recsyr Removing Chemical Weapons from Syria (2014), by Alex Knott via Flickr. Licensed under CC BY-NC 2.0.